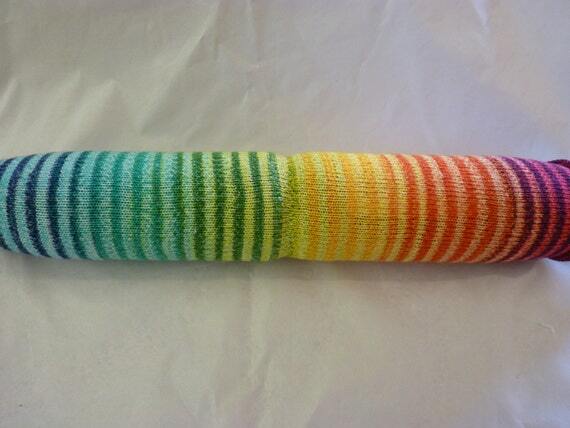 I honestly think self-striping sock yarn is like Pringles. Once you pop, you can’t stop. 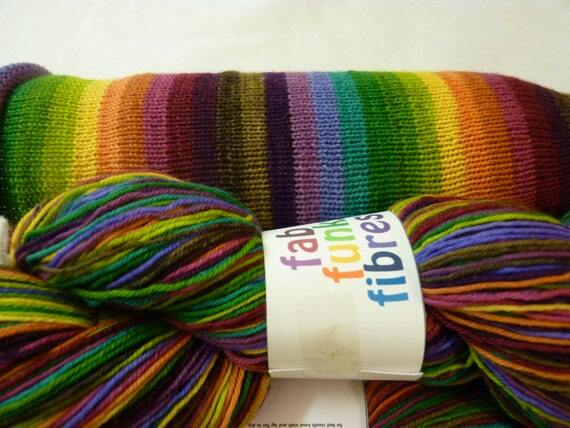 I just had a look at the Fab Funky Fibres shop the other day and oh. my. goodness. Autumn Rainbow. All the gradient self striping skeins. I Believe in the Impossible. Trying out my warping board and dying some self-striping sock yarn. Eagerly awaiting the result. Kind if looks like wrapped sallad. Instead of trying to buy yarn that’s impossible to get a hold of from rude people, I found yarn that’s just as pretty and sold by a lovely friendly woman who got back to me within an hour of me sending her a message on Etsy. Elaine at FabFunkyFibres dyed this up just for me! Usually she offers this colourway on brown, but was glad to dye it on a black background for me when I asked. Add in a mini skein for cuffs, heels, and toes, and voila! Super fast shipping and the yarn is lovely, bright saturated colours and great to knit with. 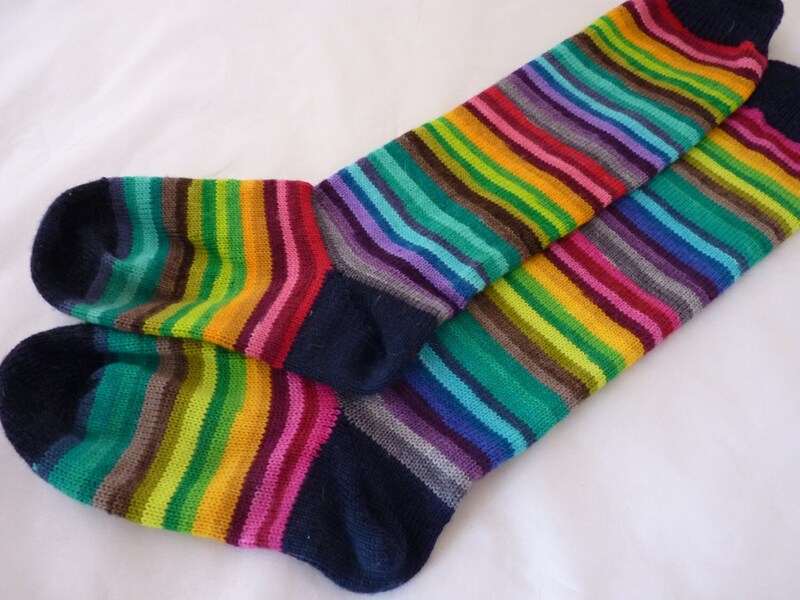 I was so happy with my yarn I ordered another two skeins (in different colourways) from FabFunkyFibres the other day, so I definitely recommend Elaine to anyone looking for hand dyed self striping sock yarn. Why make it easy when it could be hard? Remember how I HAD TO HAVE the yarn for my Tube socks? And how that yarn is hand dyed in tiny batches that go up every other week and are sold out within minutes? And how it’s kind of really quite expensive for a pair of socks? 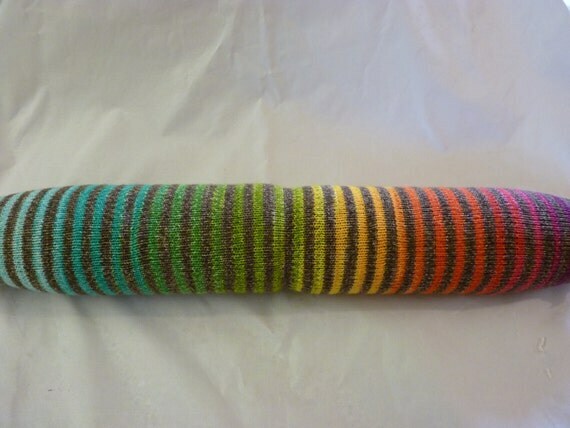 I really NEED this self-striping bright rainbow sock yarn, dyed by an indie dyer in small batches, posted every other week and gone within minutes of being up. Whyyyyy must I want such peculiar things? Why can’t I covet something that’s readily available and more affordable?! In my defense, though, I a) I loved knitting with the Mind the Gap yarn and b) love the finished socks. There are some things you just can’t get when sticking to commercial yarn.